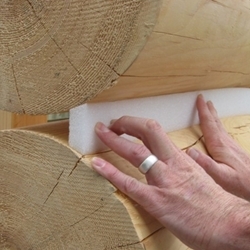 Grip Strip is chemically inert closed-cell polyethylene that is shaped to fit between log courses to form a flat surface for the application of Perma-Chink log home chinking or Energy Seal log home sealant. This makes it easier to maintain a consistent thickness of sealant across the seam. I used this with Perma Chink and it was really easy to use. I had traditional logs, with lots of knots and weird shapes, and just trimmed each piece to fit, then applied the chinking over the top. From what I can tell, it's another great product from these guys!! Very pleased with this foam backer product! I used it along with my Perma-Chink chinking between 10 inch round logs. The shape of Grip Strip was perfect for my logs and made it easy to apply chinking. Good product.